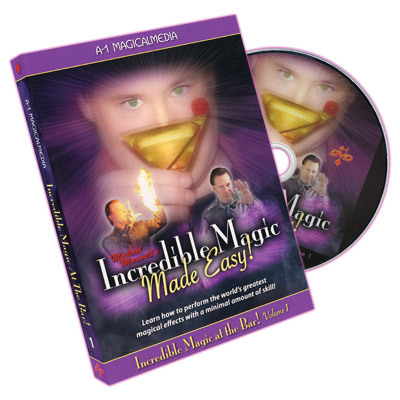 Michael Maxwell's Incredible Magic...Made Easy! is a multi-volume DVD series designed to teach you how to easily master and performm some of the greatest magic tricks ever created! Each set in the series covers a different and unique type of magic, such as Bar Magic, Card Magic, Coin Magic, Rope Magic, Silk Magic, Impromptu Magic, Mental Magic, Money Magic and many more! Magic at the Bar, Volume 1 teaches you the incredible secrets of performing magic at the bar. Amazing magical effects that are easy to perform on either side of the bar, but espicially suitable for bartenders who wish to raise their image top a new level. Return customers are guaranteed; they will bring their friends to witness your incredible magic. Imagine the extra cash you can earn by increasing your tips...all because you have baffled and entertained your customers like never before! EXTRA BONUS! A trial version of Barware Deluxe, an amazing software program that "virtually" teaches you how to mix almost any cocktail! SUPER BONUS! A special gaffed card needed for Michael Maxwell's Anywhere Cards, an incredible effect wherein two selected cards magically travel to two impossible locations! 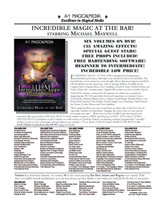 Click on the following thumbnail image to get a full-size printable flyer for Incredible Magic At The Bar!